Extreme sports have become ever popular with many adrenaline junkies getting their heart pumping while staying fit. One of the major disadvantages of extreme sports is the disastrous effect it can have on Mother Nature. Some of the extreme sports that make this list are motocross, snowmobiling and Red Bull air racing as they have a significant carbon footprint. If you are an avid lover of extreme sports but also have a respect for Mother Nature, then here is a list of green extreme spots that can be done in the UK and across the globe. No carbon emitting equipment, just the tough pair of shoes on your feet. This was developed in 2005 when trick riders fastened a surfboard to their horse and performed tricks. Some time on, this is one of the greenest extreme water sports around with no harmful emissions being pumped into the air. 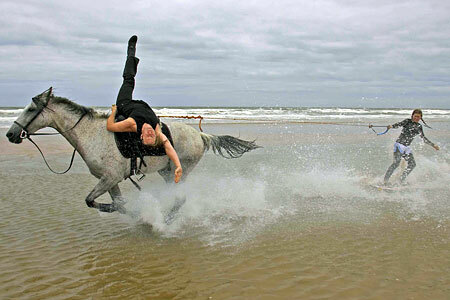 Australia is a country that enjoys this extreme sport the most and a horse can go up to 35 miles per hour which makes for great acrobatics tricks in the sea alongside. This sport may seem extreme for two reasons, one being that it is a fast paced race with another person’s body weight to carry, and the other because it’s your wife, so immense care must be taken not to drop her. It involves no equipment or engines. For more than 200 years people have been chasing a wheel of cheese down a steep hill in England. This, among the strangest extreme sports is full of action. Racers line the top of a steep hill and plummet by any means necessary down the hill; the winner wins the cheese. This is one of the more painful extreme spots but is none the less green, and purple, that is the colors your shins will be after the match. This extreme spots adventure is simple, requires no equipment, and can be practiced just about anywhere. Shin kicking is part of the Cotswold Olimpick Games. This is definitely the most dangerous among the green action sports covered. One slip, one mistake and that’s it, your life could be over. Free solo climbers ascend with no gear, ropes or harnesses, just a pair of climbing shoes. Definitely the greenest among extreme sports but the most dangerous too. Jemma Scott is an avid writer of innovative green methods and looks at extreme sports in this article. Her interest came from her passion for extreme sports as she braces the outdoors frequently in work trousers. This entry was posted in Bizarre, Land Sports, Rock Climbing and tagged chasing the cheese, free solo climbing, green extreme sports, horse surfing, shin kicking, wife carrying. Bookmark the permalink.